The Eisenhower Executive Office Building was built in 1871 to house the War and Navy Departments, replacing the obsolete War Office building on the same site. 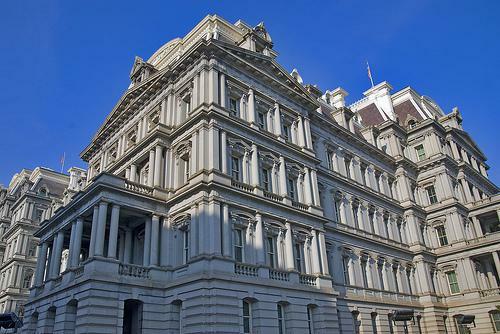 The Eisenhower Executive Office Building was built in 1871 to house the War and Navy Departments, replacing the obsolete War Office building on the same site. By World War II, the War and Navy Departments outgrew the building, and were spread out in numerous additional temporary structures on the National Mall. After the military relocated to the Pentagon in 1943, the building fell into disrepair and was regarded by President Harry Truman as 'the greatest monstrosity in America'. The Eisenhower Executive Office Building has since been used for Presidential executive offices. The first televised Presidential news conference took place in the Indian Treaty Room in 1955, and the building now houses the Vice President's office, along with the National Security Council and other executive offices.